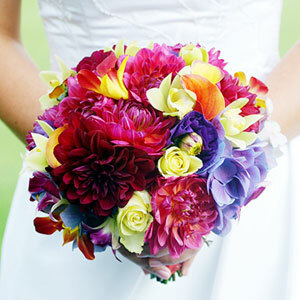 Following up on my previous DIY flowers post, here's another from Better Homes and Gardens. 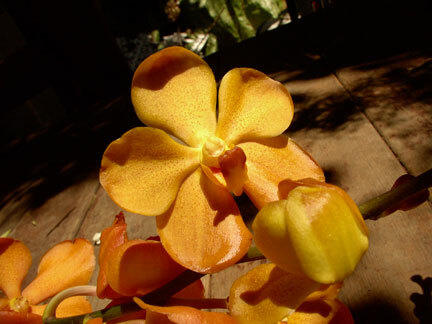 From that site, I've been immersed in researching flower-decorating ideas. Following is my work-in-progress, draft vision. 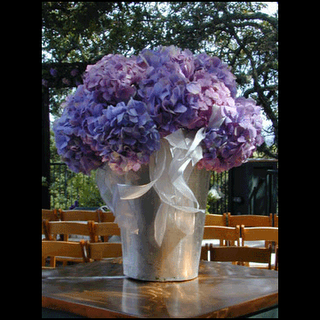 For the banquet at night, I was thinking of gathering a bunch of shiny buckets (probably of different sizes) and arranging them in various groupings -- some scattered by the sign-in table, some by the cake, some on the head table? 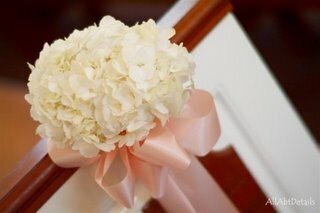 -- instead of having just a few of the giant floral arrangements that many florists will make. 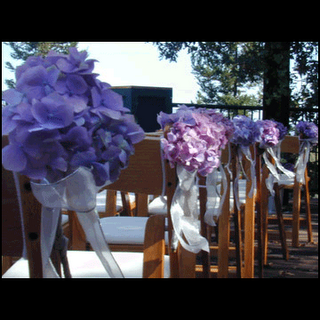 I think the same groupings can be made for the front of the church in lieu of the main altar centerpieces. The only thing left to figure out is what flowers to use. I think I will need at least some flowers with some height, like the gladioli at right (though I'm not a fan of the gladiolus, so maybe some branchy orchids or willow?). 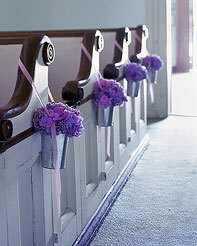 Ideally, some of the buckets for the banquet decorations would come from these buckets hanging from the pews, via Martha. 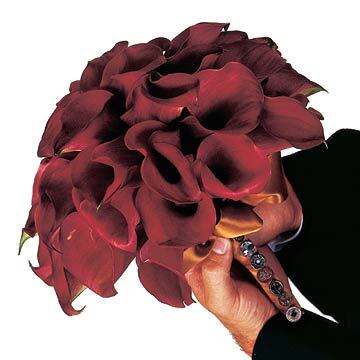 Using less arranged pieces would also make it easier to give out the flowers at the end (they'll likely last longer too b/c they'll probably be sitting in water, not stuffed into foam). 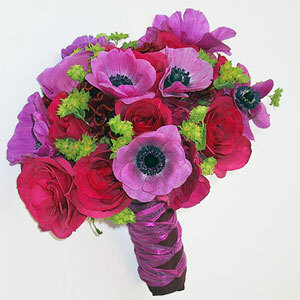 Or, instead of a ribbon hanging from the flower, flowers hanging from the ribbon, from www.wiggyflowers.com. 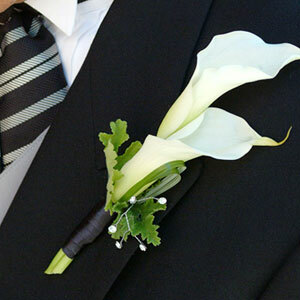 Most likely it'd be a double flower for the groom, just one for GMs. I do lke hydrangeas but not sure if it'd be easy to find an appropriate color (purple would clash with the red, I think). 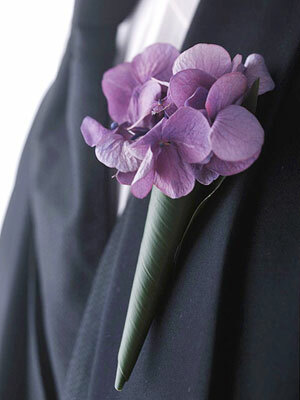 Here's a good how-to on corsages (sans feather please), which I imagine is similar to making boutonnieres. I've also heard that you can order flowers through Whole Foods (specifically the one at Columbus Circle, though I have a feeling any of them would) and Costco. 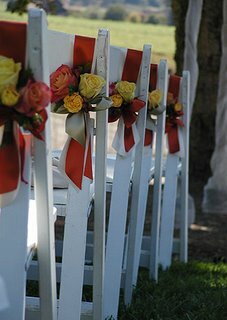 Martha bucket idea: I really like that one. Also plus points for being able to resuse them later on. 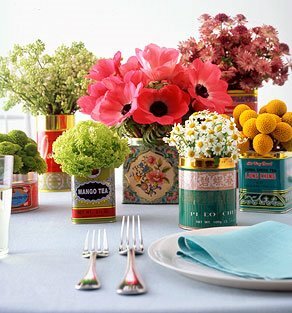 Martha tin tea can: I saw it too on some other website and loved it. I thought it was a cutesy idea. 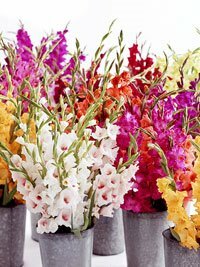 You can also do different blooms for the different tins, which I think can save you $$$ and give you a variety of flowers to play w/. However, depending on decor and theme, the tins can come across tackey. 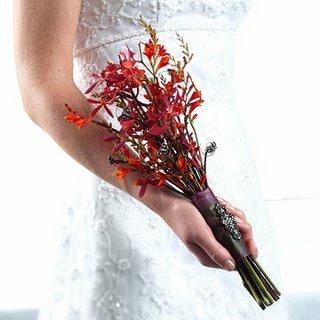 Question: Do you think you will run into the risk of having too much on your plate trying to do your own flowers a day or two before the wedding? Hehe, good question. I'm trying to recruit ppl to understand my vision so that they can run on their own.